The Ultimate Ears BLAST and MEGABLAST are good speakers overall, but there were two main areas in which we felt that they weren't quite up to snuff: pricing and features. The pricing concern has largely been alleviated, with some seriously good deals being offered on both models in the past few weeks, but we hadn't heard much on the feature front. Ultimate Ears has just announced that the BLAST and MEGABLAST will be getting Spotify Connect support, as well as some features it should have shipped with. In total, Ultimate Ears lists four new features. The first is enhanced controls from the Ultimate Ears companion app; this includes controlling volume remotely from the app (which I've already been able to do for some time, so I'm not sure why it's listed), checking battery status by pressing the +/- buttons on the speaker simultaneously (it's live and works quite well), and starting in May, custom EQs for specific artists/genres will be made available. Spotify gets two mentions here. You'll soon be able to say something like "Alexa, play my Discover Weekly," or any other music from Spotify; this was previously available on services like Amazon Music, Pandora, iHeartRadio, TuneIn, and more, but not Spotify. More interestingly, Spotify Connect support is being added soon; this will make the BLAST and MEGABLAST the first UE speakers to have this integration. This way, when you're connected to Wi-Fi, you'll be able to play music directly to your speaker(s) without having to connect via Bluetooth. That's pretty neat. Lastly, you'll soon be able to group up to eight BLAST/MEGABLASTs via Bluetooth and Wi-Fi. Stereo mode will engage when two of these speakers are connected. Ultimate Ears says that this linking-up will allow for greater range and improved connection reliability due to its use of Wi-Fi. 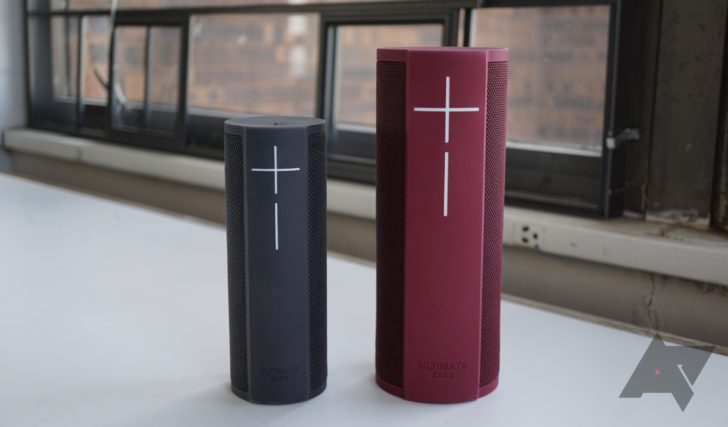 In summation, basically everything that the UE BLAST and MEGABLAST should have been launched with, some of which were on the previous UE BOOM 2 and MEGABOOM, will soon arrive. If UE had just taken some more time to implement these things prior to launch, perhaps it wouldn't have had to discount its speakers by 50% and more just months after launch. Enhanced controls on the Ultimate Ears app: You can now control volume remotely from the app, which is especially useful if you have your music cranked up loud and want to use Alexa. You can also check battery status in two ways - either through the app, or right from the speaker by pressing the “+/-” volume buttons simultaneously. Starting in May, you can personalize your sound for any artist or music genre with the custom equalizer (EQ). Voice control on Spotify and more (coming soon): Just ask “Alexa, play my Discover Weekly” or any music from Spotify on MEGABLAST and BLAST. Spotify will soon join other Amazon Alexa supported music services such as Amazon Music, Deezer and TuneIn globally; and Pandora, iHeartRadio and SiriusXM in the U.S. -- use your voice to control music from these streaming services over Wi-Fi. On Bluetooth, you can enjoy music from any of your favorite music services. A better way to listen with Spotify Connect (coming soon):MEGABLAST and BLAST will be the first Ultimate Ears speakers to integrate Spotify Connect. When on Wi-Fi, open the Spotify app on your phone and play music directly to our speakers (under “Devices Available”) without the need to pair through Bluetooth. Music fans can also stream the highest quality sound possible from Spotify. With Spotify Connect, text message or make calls without interrupting the music and save your phone's battery. Combining ultimate 360-degree sound, sleek design and the convenience of hands-free voice control on Wi-Fi, BLAST and MEGABLAST are part of Ultimate Ears’ new Wi-Fi and Bluetooth smart speaker range. MEGABLAST and BLAST deliver a battery life of up to 16 and 12 hours respectively, a range of up to 330 feet on Wi-Fi and are waterproof and dustproof (IP67 rated). MEGABLAST is the loudest, most powerful and best sounding speaker to date from Ultimate Ears. Meticulously engineered from the ground up with custom drivers to produce a full and crisp sound, MEGABLAST is 40 percent louder than Ultimate Ears MEGABOOM. Place BLAST or MEGABLAST on Ultimate Ears POWER UP, a convenient charging dock that makes charging easier. The speakers will stay powered on when placed on POWER UP, making Alexa voice control always available via Wi-Fi for music, smart home controls and skills. Ultimate Ears MEGABLAST, Ultimate Ears BLAST and Ultimate Ears POWER UP are available in Australia, Austria, Canada, Germany, United Kingdom and United States for suggested retail prices of $299.99 for MEGABLAST, $229.99 for BLAST, and $39.99 for POWER UP. Pricing varies by country. All speakers and charging dock sold separately. The free Ultimate Ears app is available for iPhone on App Store and for Android™ on Google Play. For more information, please visit www.ultimateears.com or connect with us on Instagram.